Before we begin, lets see if we can give you some idea of what's going on with your phone. CAUTION: If after reading these instructions, you don't feel you can test your line or feel it is unsafe. Don't take a chance. Call your local service provider or your phoneman for assistance. These instructions provide a general overview, in plain talk, on how to test your phone line. The information that follows are steps that a technician might take when he arrives at your home or office, or steps your local service provider might ask you to do before a technician is dispatched. This is something you can do yourself, maybe save a buck and get your phone back on more quickly. This general information is free and is an attempt to educate those not familiar with the process and make them more at ease testing their phone line. Please read all the information before you attempt to test your line. NOTE: If you live in an apartment complex or other multi unit environment, your telephone wiring may share a community serving terminal. This simply means all the wiring is pulled to one central location and access is usually thru the maintenance department for your complex. There should be an interface which allows you to test your line there. Contact the office for instructions on testing your line or lines. All my phones are dead. In this case, you will want to check with your neighbors to see if their phones are dead also. If your neighbors are having the same trouble, call the phone company and report several phones are out of service in your area. With construction going on all the time, a major cable could be damaged and causing the outage. My neighbor's phones are working ok, but all my phones are dead. Scroll down to the NID and follow the test instructions.. NOTE: Check the local environment around your home. Has there been and digging or construction work? If so, your drop, (the line that runs from the telephone company terminal to your home), may be damaged or cut. The local phone company will have to make these repairs because the drop is on the regulated or phone company side of the NID. All my phones are noisy. Scroll down to the nid and follow the instructions for testing your line. One bad wire, bad phone, or jack inside your home could affect all your phones. I have several phones, but only one is dead or noisy. You could have a bad inside wire, a bad jack, a bad line cord, or a bad telephone set. Start by unplugging the line cord at the telephone base and plug it into a known working telephone set. If it works, your set is bad. Replace it. If it does not work, replace the line cord with a known working cord, if it works, your line cord is bad. If it still does not work, the jack or wire is defective. I want to stop you here because technical knowledge is required to make the repairs and if not done properly could affect your other phones or put your line out of service completely. Caution: There is also the risk of electrical shock on telephone wiring. Contact your telephoneman for repairs. Click here to go to the work center and find a phoneman near you. NOTE: I get calls from folks wanting their phone repaired because they paid hundreds of dollars for them and think it should be repairable and last longer because of the purchase price. If the phone itself is defective, replace it instead of repairing it, unless it has some sentimental value to you or has an unexpired warranty. The cost of labor today makes it smarter and cheaper than repairing it. They don't make them to last decades like they use to. If the warranty is still good, follow their instructions for repair. The cords or batteries on your cordless phones are about the only replaceable parts available to the general public. Don't put a whole lot of money into your new phone. Get the features you want and no more. Get use to replacing your phones like other equipment you use often, they just simply get old and become obsolete and wear out. Parts are available thru the manufacturer only in most cases and if the warranty is expired, they just don't repair them. Ask your telephoneman which brands he recommends. Check your local electronic stores for the best selection and price. Phones purchased thru local phone companies are priced higher, however, they do give you longer to pay for them, usually on your phone bill. These phones are not generally made any better than other phones and are still subject to failure at the same rate as other phones. All or some of my features such as call forwarding, call waiting, caller id, call return, etc., do not work. All feature troubles must be repaired by your local telephone service provider. Call them for feature problems. NOTE: Some caller id units require batteries to function. Always check these batteries before calling your service provider on caller id problems.. The Nid is there for your use and instructions are usually printed on the inside cover. We recommend that you become familiar with your nid and how to use it. The best time to do this is when your phones are working properly. This will give you an idea of what should be there when you need to verify your line. Do not be afraid to test your line. Just remember to put the NID back the way you found it. Your local service provider is responsible for providing the Nid. Your Nid may look different from the above example depending on your local company. Your Nid should operate the same way nationwide. CAUTION: Only open the customer access doors. Electrical shock hazards may exist under other access doors. If the Nid shows signs of melting or smells hot, don’t touch it! Your telephone line is, or should be, bonded to the electrical power neutral ground and if there is a malfunction, hazardous electrical current could be present. Contact your local service provider if this condition exists. To open: Take a flat head screwdriver and turn the customer access screw counter-clockwise. Open the door. If the door still seems tight, there may be some sort of snap to hold the door closed in case the screw is missing. Push to release the snap. Do not discard or loose the screw. You will need to restore the Nid back to the way you found it when you are finished testing. CAUTION: It's always a good idea to call one of your utilities and let them know before you dig in your yard. They will advise you as to what action to take before you dig. Don't take a chance of putting your own, or your neighbors utilities out of service. Some companies will charge you for repairs if you dig before you call and do damage to their plant. This example shows a 2-line NID. Line one is on the right; Line two is on the left. Notice that all the wires are connected to the line 2 interface. Your Nid may have only one line or could have more than two. Line one is usually the main line in your home. Line two is usually for a modem or second line for a teenager, but not always. In this example, line one was disconnected and the wiring, or jack, was moved to the second line. Standard 2 line Nid with one line. Note: If you need to "disable the demarc" to connect your digital phone, simply unplug the test cord inside you NID. 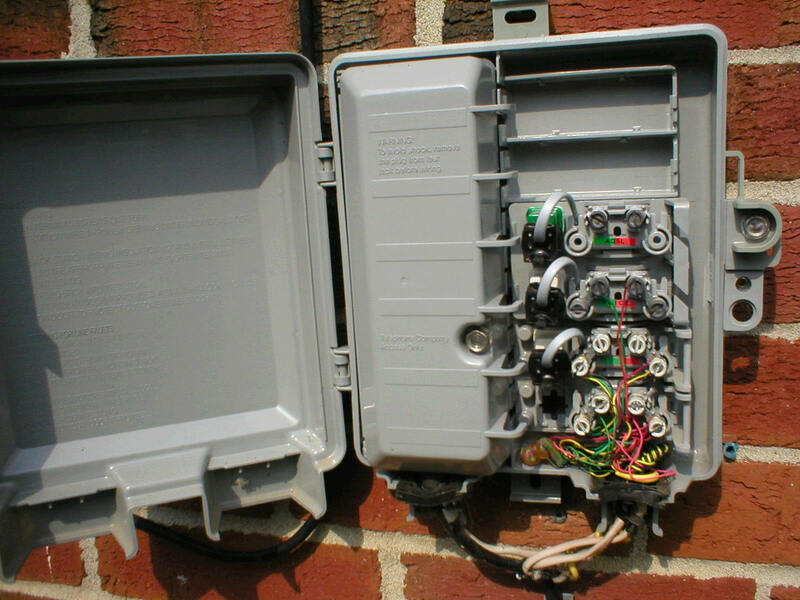 This will disconnect the wiring and jacks inside your home from the local telephone network. This example shows a home with two lines and a dsl filter. This example shows how complicated it can be to identify the line that you want to test. Normally the line with the most wires in the main line. Follow these procedures to test your line. You will need a standard type telephone to test your line. Don’t use a cordless phone to test your line. Make darn sure you are using a telephone that works for testing. A defective test phone will not give a reliable test. How do you do that? Go next door or to a friends house and use one of their jacks to test your phone. Unplug the line one test jack. It works just like your cord on your phone. Insert the cord on the test phone into this jack. If there is dial tone, call someone you know that has caller id and be sure this is the line number you want to test. If you don’t know anyone with caller id, just have him or her call you back at your number, or use your wireless phone. If the phone rings, you are on the right test jack. If not, check the line 2-test jack for your number and so on. NOTE: Now is a good time to identify your line. Just put a single identifying mark next to your line. Don't use your telephone number or your name to identify your line. Any nid can be opened and that information is confidential. Use numbers instead, or simply make a note in your personal file. If this is the correct number and the dial tone sounds good on the test, then you have a problem inside your home or office. If there is no dial tone on the test jack, unplug the test phone, do not plug the Nid jack back in, wait 15 minutes and check again. The phone company central office will sometimes disconnect lines that are in trouble because they tie up needed resources. It will reset the line once the trouble fault is removed. Sometimes this action happens before you can plug a test phone into the test jack, other times it takes longer. If there is no dial tone on the second test, call your local service provider for repairs. Your problem is on the telephone company, or regulated side of your line and they will have to make the repairs. Restore the Nid. Plug the Nid cord back into the test jack, close the door and tighten the retaining screw. If dial tone is present at the Nid, then the trouble is being caused by something inside your home. It will take some additional testing to isolate the fault. Restore the Nid, plug the Nid cord back into the test jack, close and secure the door. Go inside and check your phones. If there is a dial tone, call someone and have him or her call you back. 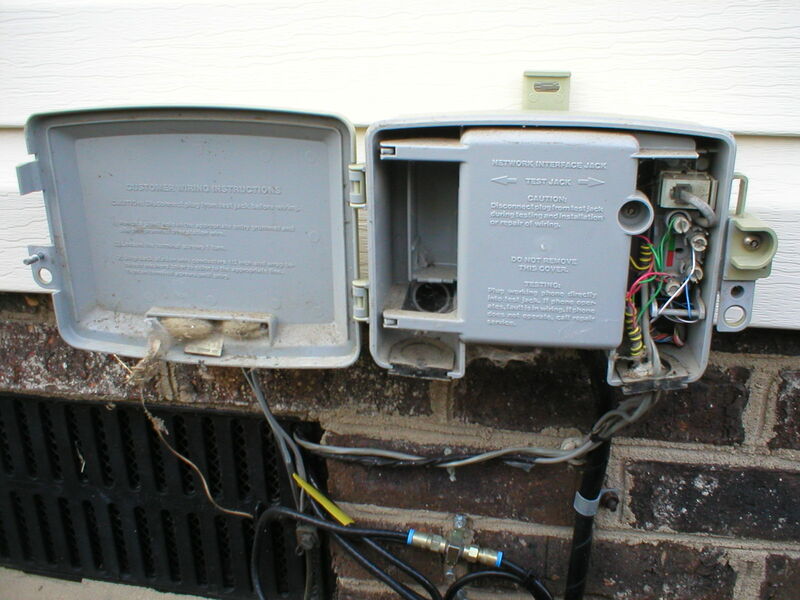 Sometimes just disconnecting the current going to a phone or answering machine will cause it to reset and release the line, especially after electrical storms. If you can make and receive calls then your line is probably ok. If the line is dead, busy or noisy, there is still a problem. Start by unplugging any cordless phones connected to the line one at a time. Unplug one phone and test any phones still connected. If dial tone is present, make and receive a call. If you can do this, then the last phone you unplugged is defective and is affecting your line. Discard or replace this phone. Still not working, leave this phone unplugged, wait 15 minutes and check again. If there is a dial tone, then the unplugged phone is defective. Still not working, unplug all devices connected to the phone line one at a time, test. Remember to wait 15 minutes to confirm the test. When the line comes clear, the last device unplugged is defective. This might take a long time to do depending on the number of devices you have, but it might also save you a service charge and get your line back on more quickly. If this does not repair the line, you will need to call for professional help either thru your local service provider or your private telephoneman. There is sometimes more than one fault on the line, especially after electrical storms.